I went to New York City a couple of months ago. No, not to visit Ground Zero; I've got my own explosions to mourn. I went to New York City last week to visit my estranged and dying father. You might ask how your father can become estranged, unless you're like me, and you already know. Didn't Tom Hanks play a scene like this in a Garry Marshall movie? Oh, never mind that now. My father's a cross between Woody Allen and Rudy Giuliani - he's got Allen's good looks, and Giuliani's cancer. Only my father's appears to be terminal. The good looks or the cancer? I don't know, maybe both. I jumped in the cab, and headed off to Mid-Town to meet up with some college buddies. They had a surprise planned, and a great one at that: skating in Wollman Rink in Central Park. As I walked through the crispening night air, passing Central Park horse cabbies and marveling at Trump Towers, I reflected on the grandeur of a New York night. Sure, most out-of-towners or the bridge and tunnel crowd might prefer Rockefeller Center, but I liked Wollman. 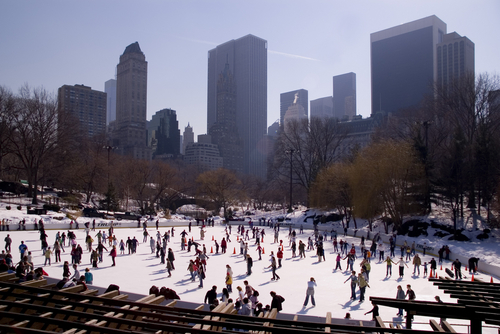 Crowded, bustling, and noisy, with rings of child skaters, mostly girls, holding the wall and teens backwards skating in fabulous loops, the rink personified what some of us call "a New York moment." It teemed with people, everyone intently skated in circles, no one looked up, and occasionally a few of us fell. After my second or third fall, I sat on the rink and looked around. Teens hot-rodded, lovers clung, children gripped, and writers - like me - observed. The first four lines of U2's song, "Stuck in a Moment" came to mind, and then all of a sudden it hit me. I shouted inwardly, "I am not afraid, of anything in this world, there's nothing you can throw at me, that I haven't already heard." Purists may say that I waddled around that rink, or shuffled, or even crawled. I say I soared, and that's all you need to know. Which brings me back to Ground Zero, and New York, and my Father. For me, the three are somehow conflated in an inexplicable mystery. Of course, it took me three falls to see it. But, as I sat there on the ice, I realized that I had been so afraid of falling that I wasn't having any fun. Now I had fallen three times and what had happened? New York City stands, and so did I. I met up with my Father the next day; it's anti-climactic to tell you the details, so I won't. Skating around that glorious rink, I knew that everything would be "beyu-ti-ful," and it was. visit the rink. It's best if you go in winter, and especially good if you go alone. Don't worry about the line; there'll be one. Don't worry about falling; you will. Go for the moment when you stretch your hands out flying, look up at the hotels in the distance, and just for a New York moment, transcend your own Ground Zero with the exuberant courage of an American who believes in liberty and justice for all.